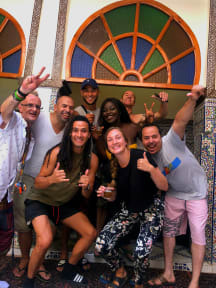 Riad Itry is een goed gelegen hostel in de medina van Marrakech, waar de Marokkaanse gastvrijheid is zeer goed vertegenwoordigd. Deze plek is speciaal gemaakt voor reizigers die willen weten en krijgen de meest authentieke van de medina van Marrakech. Very nice hostel with super friendly staff. I got a lot of information from the owner, to eventually book a 2-day tour to the a Sahara desert. Location is within the old Medina but also close to the New Town, which in the end, a pity, I hardly visited. Facilities are basic but enough and because of the time of the year it was pretty quiet in the hostel. But it is great value for money and I had an awsome time in the middle of a real historic but lively Moroccan city. Nice and quiet location just a bit outside the real touristic medina part. The staff is nice and know a lot about the city and the neighbourhood, relaxed atmosphere. 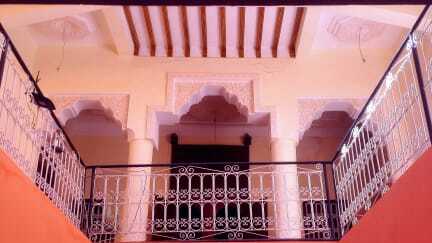 The riad is a humble place, has a very nice patio, all facilities are there. It is close enough to all the tourist attractions (walking distance), but not in place full of tourists. The area gives is still quite authentic and calm, small shops and vendors on the street and kids playing outside, playing the drums in the evening. A hostel for a democratic price but the surrouding of the hostel is a bit overwhelming for a European. But you get used to it.